Cherry is 23% softer than Red Oak, which is the benchmark of the Janka scale. Clear grade Cherry flooring is color-sorted for a rich consistent deep reddish pink color. Clear grade is the best flooring grade and made of the highest grade (export grade) lumber. No white sapwood is allowed in this grade. Select and Better Cherry flooring is color-sorted to remove white sapwood, knots, mineral streaks, and surface defects such as cracks. Slightly more color variation will be present than in the Clear grade, but it will still have mostly consistent color. Select and Better Cherry is also referred to as Premium Cherry. #1 Common Cherry flooring is lightly color-sorted to remove the worst of the white sapwood. Small dime-sized knots are allowed, as well as mineral streaks. Some white sapwood is allowed in this grade. 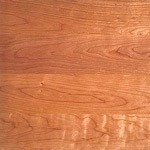 #2 Common Cherry flooring includes all the character found in the wood. Large knots, white sapwood, worm holes, and other surface defects are included in this grade. Other common names are Rustic Cherry, Mill Run Cherry, and Tavern and Cabin Grade Cherry. Quarter-sawn Cherry flooring is made from special lumber that is cut perpendicularly to the tree’s growth rings. Quarter-sawn flooring is more expensive than Plain-sawn but is more stable. The vertical grain produced is much different in appearance from that of Plain-sawn.